Marmash believes there is a significant demand for vision technology as part of the quality control procedures for functional components such as engines, drives, and chassis components, as well as parts for passenger safety such as brakes, steering, airbags and seat belts. In addition, electronic components including cable tracks, switches and displays are inspected with machine vision during production. He noted that the adoption of vision has progressed from just being used to inspect components and assemblies to being used throughout the entire production cycle. Furthermore, vision systems are employed in the inspection, classification and selection of raw materials, as well as for robot guidance. Developments in camera technology, together with processing speed and software, are all high on the list of advances that have made these types of inspection technology possible. ‘High-speed, high-resolution line scan cameras provide added resolution capabilities, and smart cameras and multi-camera vision systems benefit from more sophisticated software, often with measurement algorithms developed specifically for the automotive industry,’ said Marmash. He added that affordable 3D laser triangulation smart sensors have further expanded the inspection possibilities with automotive-specific tools such as gap and flush, which ensures perfect alignment. Munkelt added that other vital aspects are long-term availability of the vision products – including support – as well as comprehensive knowledge of disparate technologies, from simple 2D measuring methods to 3D vision and image sequence analysis. If the technology is integrated into vehicles, robots or intelligent cameras, vision solutions have to work on a wide range of platforms. GigE Vision external frame grabbers allow a manufacturer to retrofit an existing system to realise the cabling, computing and networking benefits of Ethernet, while maintaining much of the existing infrastructure, commented Ed Goffin, marketing manager at Canadian company Pleora. Pleora provides this type of solution, which helps reduce complexity and costs by enabling the use of off-the-shelf Ethernet switching for more cost-effective networking of a multi-camera system. According to the company, the extended-reach, more flexible cabling is particularly well suited to robotic inspection systems. ‘By migrating to a GigE Vision-based system, the customer can use lower-cost computing platforms for processing, analysis, and display,’ said Goffin. ‘Right now, the inspection system that we’re designed into is more geared towards high-end car manufacturers. However, increasingly the higher-level performance more typically associated with luxury vehicles is becoming a standard feature for mid-market cars. That puts more pressure on manufacturers to find ways to reduce design and manufacturing costs, which will drive further robotic inspection applications,’ he added. Looking to the future, Goffin believes there is also an opportunity for USB3 Vision interfaces, where plug-and-play capabilities allow simpler set up and tear down for short-run production and quality inspection systems. For a robotics system, for example a bin-picking robot, the image feed from a legacy camera can be converted into USB3 Vision-compliant video by an external frame grabber. The uncompressed video – along with power and control – is transmitted with low, consistent latency over more flexible USB 3.0 cable directly to existing ports on a computer used for analysis and display. VisiLine IP protected cameras offer resolutions from VGA to four-megapixels at up to 160 frames per second. Besides IP 65/67-protected housings, standardised and screwed Gigabit Ethernet connectors are a decisive connectivity element, and the CAT 6A-compliant M12 connectors with x-encoding are even capable of 10 GigE transmission. Cameras like the VisiLine IP models can be deployed using Ethernet cables up to 100 meters in length and flexible PoE, also as one-wire approach. This is of significant benefit in applications where the camera is directly installed at the robot, while the extended cable length allows for the camera control to be outside the robot cell. Wehner added that for quality control or optimum positioning, the camera can be attached directly at the robot and must in no way impair the robot’s movements to perform its work. In addition, as the size of the parts to be inspected varies according to the application, flexible and automated adaptation of the inspection task to the product is needed. Finally, full traceability of the parts and components in the manufacturing process is another important factor for smooth overall process flow. 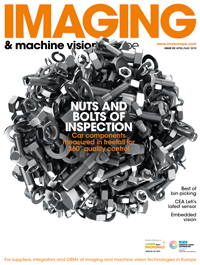 ‘Every facet of automotive manufacture, from individual component and sub-assembly manufacture to final vehicle assembly, has the potential to be influenced by vision technology, but there are also many ancillary applications in the industry where vision is used,’ commented Stemmer Imaging’s Laith Marmash. ‘This ranges from high-speed vision systems used to provide accurate analysis of vehicle behaviour in crash tests, to the use of in-vehicle cameras. Reversing cameras, lane departure and traffic sign recognition systems, for example, are now options in many cars. With increased competition, consumers are now starting to expect them as standard options. ‘Five years ago they were only seen in prestige cars, but if the trend continues not only will they be in all cars but they’ll be doing a lot more too – especially with the recent advances in gesture control and the development of autonomously controlled vehicles.’ Marmash added that Stemmer Imaging is currently working on projects that will be replacing key parts of a vehicle’s functionality. Pleora’s Ed Goffin agreed there may be further opportunity for machine vision applications within in-car visual systems. ‘Today, the majority of applications for machine vision in the automotive industry focus on identity, verification and inspection. We believe there is an opportunity for machine vision products within the increasing number of vision-based systems now common within almost all vehicle models, particularly as manufacturers seek higher-performance solutions to differentiate themselves. He also highlighted that one area attracting interest is ‘shape from shading’ technology, which uses specialised illumination and image processing combinations to allow 3D imaging of difficult reflective plastic and metal surfaces. This has already been used to detect defects of just a few micrometres depth on small components used in fuel injection pumps, lowering scrap rates from around 10 per cent to below 2 per cent. This technology can identify defects in materials that wouldn’t be possible using traditional machine vision techniques. Marmash also noted that the automotive industry is moving away from the traditional view of zero tolerance of any defect, however small, and towards differentiating between critical and non-critical defects – those that affect the functionality of the object and those that do not. The use of vision will greatly enhance the ability to make those judgements. ‘Machine vision technologies will significantly change and further develop processes in automobile manufacturing. Thus, Industry 4.0 concepts being discussed and partially already implemented today will have long become common practice 10 years from now,’ said Munkelt at MVTec Software. ‘Vision methods will improve many aspects of manufacturing, and various workpieces will be quickly and reliably detected and production processes controlled on this basis. 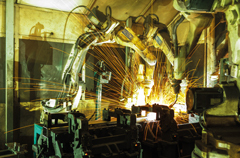 The technology will revolutionise the maintenance of production machines. Cylinder bore inspection is a procedure that has become increasingly critical during the last decade. This is in line with the ongoing development of ultra-clean combustion engines. The ‘mission impossible’ for engine designers is obtaining maximum performance from ever-lighter engines while significantly reducing harmful emissions. In facing these challenges, engine designers are focusing their attention on every aspect of engine optimisation, and a key area of focus is the surface finish of cylinder bore walls, where significant optimisation and efficiency benefits can be realised. Optical cylinder inspection opens up a vast array of possibilities for engine designers and manufacturers – especially in the emerging areas of textured sputtered coatings, and in ultra-precision surface manufacturing. Coupled with this, and in response to popular demand, Opto has also recently launched a 3D interferometric version of its Cylinder Inspector instrument. This ultra-powerful version means manufacturers can build a complete sub-micron surface topographic map of their engine cylinder walls.